Immaculate Mother of Jesus, We honor You as God’s chosen one, beautiful, beloved, and free from all sin. Keep watch over us, pray that we may rise above our sins and failings and come to share the fullness of grace. Be a Mother to us in the order of grace by assisting us to live your obedience, your faith, your hope and your love. O so fearless and gracious. Dear, we love your mountains. That a Croat loves his homeland. Whilst his live heart beats.! The Croatian national anthem was written by Antun Mihanovic, in 1835 it was first printed in the “Danica” newspaper under the name “Horvatska domovina”. Subsequently in 1891 it was first sung as the Croatian national anthem under the name of “Lijepa nasa” by the Croatian-Slavonian Economic Association in Zagreb. Antun Mihanovic; was born 10 June 1796 in Zagreb and died 14 November 1861. Father Christopher Coric, O.F.M., Conv. Like many countries in Western Europe, Croatia was founded on the ruins of the Roman Empire. When they arrived in the territory of present-day Croatia, the Croats were politically organized in principalities. In 925, Croatian King Tomislav united the principalities, establishing the first Croatian state. Later, Croatia retained its legal status and autonomy within the framework of the Hungarian empire, and the Hapsburg Monarchy. The red-white-blue tricolor has been was officially proclaimed, and used as the Croatian flag since 1848, symbolizing the Pan-Slavic colors. Under the influence of revolutionary movements in Europe, a simple tricolor was made. The flag was, of course, without any coat of arms. However, it was used as local flag in a big empire, so it remained more or less internationally unknown, but it became one of the most important symbols of the Croatian people. Very often it can be seen on old postcards, most often together with Croatian coats (normally not on the flag, but from time to time as a part of the flag). The current flag and the coat of arms were formally adopted on December 21, 1990. when majority of the European countries recognized the independence of the Republic of Croatia. Here is an interpretation of colors of the Croatian flag made by Miroslav Krleza, a great national writer, saying that the colors represent the three symbols of Croatian history and people: blood of Croatian martyrs, Croatian peaceful lamb like nature, and Croatian devotion to God. The “historical coat of arms of Croatia” called Hrvatski Grb or a The red and white checkerboard (šahovnica) has been a symbol of Croatian kings since at least the 10th century. It was traditionally conjectured that the colors originally represented two ancient Croat tribes, Red Croats and White Croats. 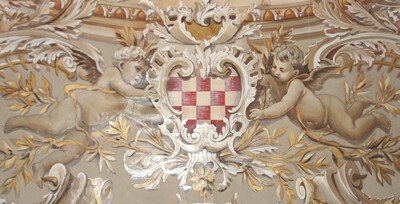 By late 19th century this coat of arms had come to be considered a generally recognized symbol for Croats and Croatia. On 21 December 1990, the post-communist government of Croatia, passed a law prescribing the design created by the graphic designer Miroslav Šutej. The oldest known example of the šahovnica in Croatia is to be found on the wings of four falcons on a baptismal font donated by king Petar Krešimir IV of Croatia (1058–1074) to the Archbishop of Split. The tie (cravat) is a Croatian contribution to the the general development of clothing and fashion. The etymology of the word cravat indicates its Croatian origin. In the mid-17th century the French introduced the word cravate into their language, to describe a piece of cloth worn round the neck. It was, probably, derived from the word Krawatte from a German dialect (the German literary standard language word was Kroate – Croat). The Oxford dictionary of Modern English Language has several different entries for the word cravat: crabbat, crabat, cravett, crevet. The word soon was introduced into other languages; the Italian variant was croatta or cravatta, the Spanish variant was known as corbata and the Flemish as krawaat. One of the popular background explanations to why cravat got its name after the Croats, is as follows: In the 17th century, during the Thirty Years’ War (1618 – 1648) in which France and Sweden had united forces against the German Empire. Croatian soldiers served as mercenaries in the light cavalries of both armies. They first gained a reputation of being exceptionally courageous and well trained within the German ranks. After the victories they won over the French troops, Cardinal Richelieu himself insisted on including Croatian mercenaries in the French army. In 1633 the first French troop made up of Croatian cavalry was formed. One of the 24 cavalry regiments formed in France in 1643, was the Croatian regiment “Royal-Cravattes”. It was an elitist regiment which fought many battles for the kings Louis XIII and Louis XIV. Its soldiers differed from other French troops in their warring strategies, arms and uniforms. A particular detail of their uniform was a kerchief knotted round the neck. Not only did the French soldiers adopt the fashion of wearing the neck kerchief, but it soon grew very popular among the civilians too.Even the French ladies members of the French court and the French nobility, wore cravats, and in the years to come, they could be seen knotted round the necks of gentlemen in other European and overseas countries. In the course of time the cravat has appeared in a variety of shapes, colors and materials, ranging from the simple knotted kerchive to more sophisticated, sometimes uncomfortable, stiff, high collars. In the l9th and 20th centuries the bow tie grew very popular. The modern tie is a narrow, long piece of silk or woolen fabric worn under a shirt collar and tied in a knot at the front. There are many varieties of patterns and colors designed to match the gentleman’s suits. Tiepins can be used to fasten the ties to the shirt. 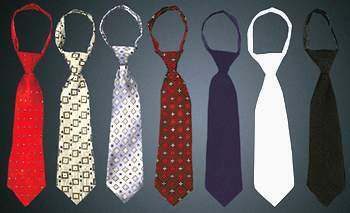 A tie could be a sign of affiliation – membership to an artistic elitist group (the style a la Byron or Baudelaire), or belonging to the middle class, to the class of farmers and even revolutionaries (thus, the common feature of the 1789 French revolutionaries was a black kerchief tied around their necks).